Few things in life inspire complete awe. Weaving through the intricate islets of World Heritage-listed Halong Bay is one of them. Begin your travels in bustling Hanoi. A place that manages to leap forward whilst still maintaining a deep connection to the past; discover secret places that make this city the artistic and cultural capital of Vietnam. Cruise along the Mekong on board Scenic Spirit and learn about the local way of life through interactions with villagers and resident monks and nuns in the monasteries. On the other hand, experience how quickly Cambodia and Vietnam are developing while exploring Phnom Penh and Ho Chi Minh City. 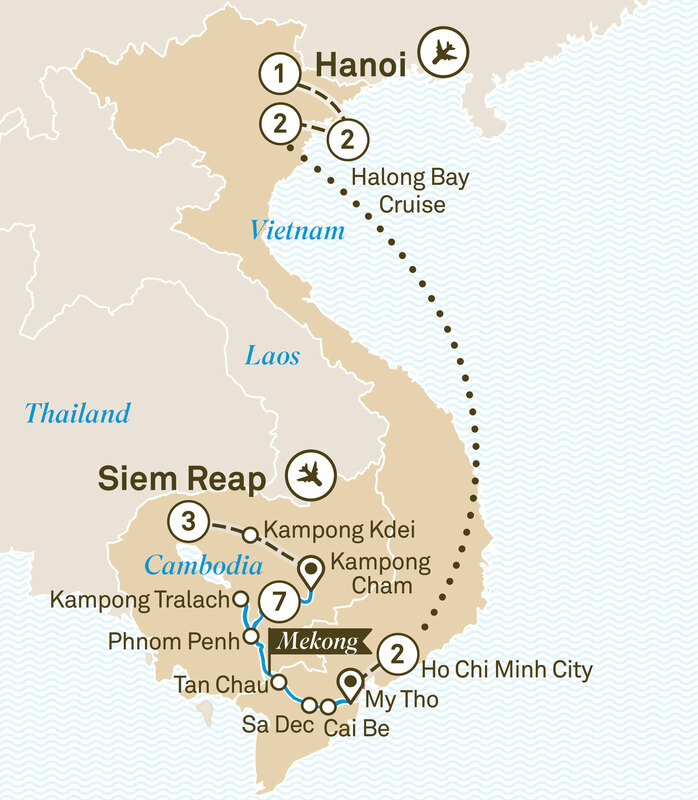 This journey showcases all the highlights of Vietnam and Cambodia in one compact itinerary. Welcome to Hanoi, the capital of a vibrant Vietnam. Enjoy the day at leisure and settle into a two night Special Stay. Tonight meet your Scenic Tour Director at your welcome briefing and dinner. Journey to Halong Bay and board the elegant Au Co for an awe-inspiring two night cruise through the picturesque waters of this spectacular World Heritage-listed icon. Exclusive to Scenic guests, savour some wine tasting on board against the backdrop of the karst islands at sunset. Relax during your morning cruising before returning to Hanoi for another Special Stay at the Sofitel Legend Metropole and a historic bunker tour at the hotel. Tonight enjoy a Vespa foodie tour of Hanoi’s old quarter by night, or La Terrace at Sofitel. Alternatively, sample Ly Club. Visit the History Museum and Hoa Lo Prison, or partake in an authentic cooking class. Alternatively visit Ho Chi Minh Quarter and Mausoleum, including a visit to the Temple of Literature. Later, on your cyclo ride, discover the maze of back streets throughout the Old Quarter. After a morning at leisure, fly to Ho Chi Minh City. Relax for the next two nights at your centrally located hotel. Travel to the Cu Chi Tunnels and learn about the underground labyrinth of war-time passageways. After lunch, try bargaining at Ben Thanh Market. Enjoy a Vespa foodie tour of Saigon by night, enjoy a meal in the surroundings of an old French colonial house or a restaurant specialising in Saigon street food. Alternatively, dine at your hotel’s restaurants – Yu Chu, Basilico or Market 39. Discover all about Vietnam’s modern history through a visit to the Reunification Palace and War Museum. Later travel by coach to My Tho to board the luxurious Scenic Spirit.